As the name implies, the split system separates the hot and cold sections of the unit. The cold section of a split system is installed inside the building, while the heating section is installed outside. This option is popular among medium-sized businesses, single-story office buildings, stores, and large homes. As cooling technology has grown, this option has become increasingly efficient. It is also popular because the noise of the system is kept outside for the most part. 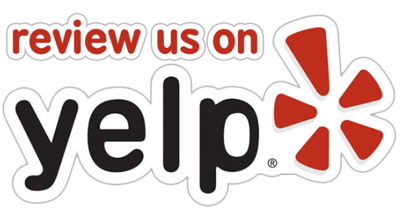 A package unit air conditioning system is an all-in-one solution that can take care of both your heating and cooling needs. The main unit is installed outside, either on the ground or on the roof. 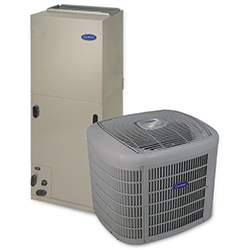 Homeowners have three options to consider: packaged gas-electric units, which use natural gas for heat and cooling; packaged air conditioners which use an electrical strip; or packaged heat pumps, which use standard heat pump technology. Packaged systems are a popular choice for homes or small business spaces that aim to conserve space by getting one multi-purpose unit. They are very energy efficient. 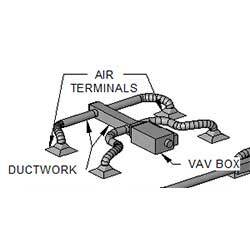 VAV stands for Variable Air Volume. 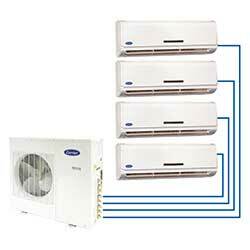 These systems are most common in larger properties that have individual spaces with unique cooling needs. For example, office buildings and shopping complexes often feature a comprehensive VAV system. This intelligent setup responds to the environment within every room of a building, allowing each to maintain a comfortable temperature. Independent controls ensure occupants throughout the building can keep individual spaces cool and comfortable, even though the entire property is connected with one large system. The mini split system is a good solution for homes that don’t have a central duct network throughout. There are two main components to a mini split system–the outdoor compressor, which can sit on the ground or a concrete pad, and the indoor evaporator and fan unit. These two units are placed within 50 feet of one another and are connected with a conduit that has electrical wiring, refrigerant lines, and special tubing. The evaporator unit is small in size and is mounted in the room that will be cooled, either on the ceiling or on the wall. It can even be recessed in drywall to make it more discreet. 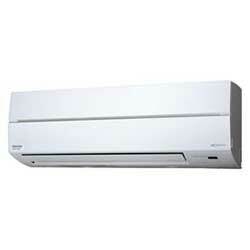 A ductless system is an easy-to-use option for smaller homes, apartments or small offices. The sleek unit, usually less than a foot in height and about 4 feet wide, attaches to the wall 8 or more feet from the floor. It is connected to the compressor and heat exchanger, which are installed outside. A simple hand-held remote controls the ductless system and brings down temperatures quickly. 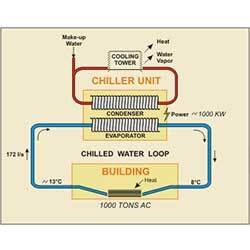 Chilled systems use circulating water to cool the air. 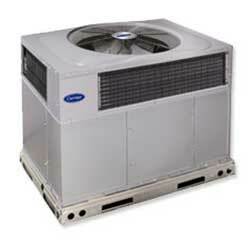 The air conditioning unit is installed on the roof or behind the office building or business. Water is cooled down to around 40 degrees Fahrenheit within the air conditioning unit’s chiller, then circulated throughout the building. Heat is absorbed from the air, bringing down indoor air temperatures. The system’s water continually runs through a chiller, compressor, and condenser. During this process, heat that is absorbed within the building is ultimately released outside the building. Chilled systems are also known as hydronic systems.